He was born in Huron, South Dakota on February 27, 1888. His family lived on a farm in Anita though and that was where Caddock grew up as a young man. A real pattern for wrestlers of the early 20th century was the top guys all having worked on a farm while they were growing up. During his time at school he took up wrestling and proved a stand out at the amateur style winning the Amateur Athletic Union (AAU) 175lb weight class in 1914 then returning the following year to win the 175lb class again and also picking up the heavyweight championship. Shortly after winning the amateur championships in 1915 Caddock was introduced to Frank Gotch and Martin "Farmer" Burns who helped train the youngster and mold him into a professional wrestling star. He could not have asked for two better people to train him. With the control both Gotch and Burns had over the wrestling world, Caddock was quickly thrust into the spotlight. Less than two years after he got started Caddock was to be apart of his biggest match of his young career. His opponent the World Heavyweight Champion, Joe Stecher. The title was up for grabs and the contest took place in Omaha, Nebraska. Papers at the time stated it was the "Largest crowd to ever see a wrestling match in Omaha." A gate of $16,000 was taken for the contest. After 3 hours and 57 minutes of wrestling Caddock came out on top with two falls to Stecher's one on April 9, 1917. Caddock had moved to Walnut, Iowa by this time where he met Grace Mickel, the lady he went on to marry in July of that same year. Grace and Caddock stayed together right up until the time of his death. Together they had three sons and a daughter. As the World Heavyweight Champion Caddock was a good draw, but it was not to last. With the American's involvement in World War I he decided to enlist in the army and spent time overseas. Even though he had never lost his championship, many claimants cropped up and staked their names to the title during his absence. The newspapers and promoters never forgot who the real champion was and thus neither did the public. When it was nearing time for his return a series of matches took place to decide who the one true claimant should be to face Caddock in a winner takes all contest. In the end it was the man Caddock had defeated in 1917 that was to face him again in a big match for Caddock's full time return in 1920. The bout was forever immortalized as it was recorded and footage of it still exists to this day. Not quite as long as their first battle, the wrestling time was "just" two hours, five minutes and thirty seconds this time around. Caddock came up on the losing end in front of a crowd of 10,000 plus bringing in an $80,000 gate. Only one fall was needed for the victory as promoters were playing around with the rules and structure of matches in an attempt to pick up business, the war had really been bad for professional wrestling limiting the international stars they could bring over. That was not the only damage done though. With Caddock being out of the picture for an extended period of time with only a couple of appearances prior to the Stecher match, he had fallen out of the loop. Gotch had died not too long after Caddock originally won the title. Caddock had also had a falling out with Jack Curley and the Joe Stecher camp was constantly gaining speed with Tony Stecher acting as a promoter and manager. Not to forget to mention the Ed Lewis camp, the "Gold Dust Trio," which was only a year away from forming, All of that combined left Caddock on the fringes of the wrestling world with only Gene Melady, the main Nebraska promoter behind him, but Melady's allegiances were not to be relied upon by this point either. Over the course of the next two years it was clear Caddock was never going to be the top guy in professional wrestling again. His leave to go to war had really scuppered up any plans for him being a long term attraction. Even though he was still drawing well on his return, there were other guys just waiting to break out who weren't as no-nonsense as Caddock and had more of a star appeal to the masses than he did. Nonetheless Caddock continued to wrestle for a couple of years into the 1920s until he decided to get out and took up operating the Ford garage out of Walnut. He was said to have been a very religious man from a young age and felt that it was more important to be at home with his family than out on the road wrestling. So that was what he did. Eventually he got into the oil business where he became the president of the United Petroleum Corporation based out of Omaha, Nebraska. A role he held until the end of 1948 when he became ill with cancer. Once he was no longer able to continue Caddock returned back to Walnut where he had one last battle against the disease which lasted until the early hours of August 25, 1950. Caddock passed away in his home leaving his wife and children behind as well as five grandchildren. How big Caddock could have become if the war had not broken out will never be known, but it's safe to say if the war didn't hamper the heights he reached, it sure did his longevity. Even with a relatively short career on the mat though, he is still one of the few fairly well known wrestlers from that time period and that in itself says something about the level of impact he actually had when he stepped upon the canvas. He also left his mark in another way; at a time when every wrestler had some kind of a nickname Caddock was no different. His name was one of the most flattering though and is still used in these modern times. 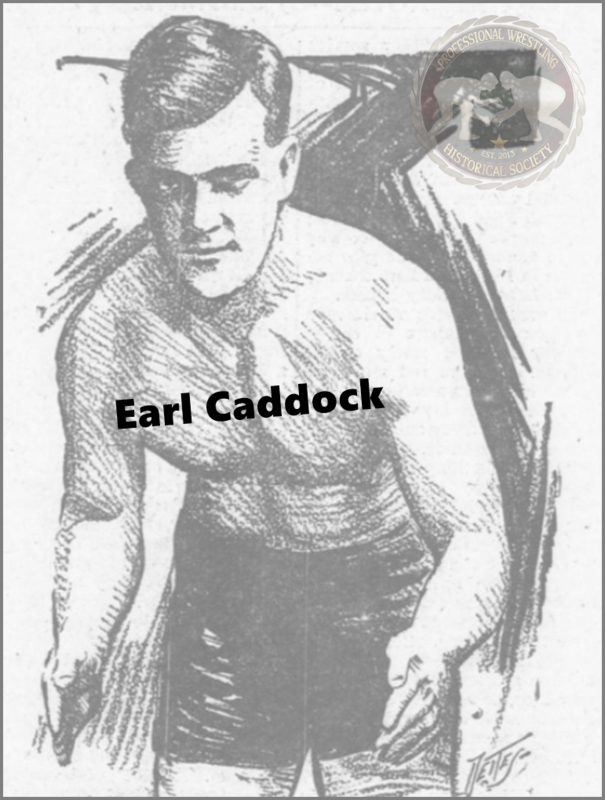 Caddock was the "Man of 1,000 Holds" due to his ability to lock all kinds of submissions on his opponents.